To ensure a passing score and receive your driver's license, be aware of these common mistakes new drivers make on their road test. Failing to follow the directions of the test examiner. Forgetting the basic rules of the road. Losing control of your emotions. Part of showing vehicle control is displaying confidence in your actions. Driving too slowly or braking too hard is not only unsafe; it will also show a lack of confidence behind the wheel. While you'll want to be careful and follow defensive driving rules, being overly cautious could negatively impact your score. Whether it's your parent's busy schedule or your own, finding enough time to spend practicing behind the wheel can be difficult—and it's often the reason mistakes are made on test day. One way you can build confidence and honestly evaluate your performance behind the wheel is to sign up for driving school. The instructors will simulate testing conditions and provide you with feedback for areas to practice before you head to the DMV. Come to a complete stop when making a right-hand turn at an intersection. Come to a complete stop behind the demarcation line at a stop sign or red light. Part of defensive driving is keeping a safe distance between your car and the other vehicles on the road. This will help you to avoid an accident by providing enough time to react should you need to brake suddenly. While it is generally recommended that you keep a few car lengths between the vehicle in front of you, refer to your state's driver's manual if you're unsure of what constitutes a safe following distance. Instead of following the speed of other drivers on the road, pay attention to speed limit signs and adjust your speed accordingly. In order to demonstrate proper control of your vehicle, it is recommended that you keep both hands on the steering wheel during the test when possible. The general rule is to think of your steering wheel as if it were a clock face, and keep your hands where the numbers 10 and 2 would be. During practice, form good driving habits to avoid a slip-up while you're being graded. Signal your intention using your turn signals. Check your side and rear view mirrors for other vehicles. Look over your shoulders to check your blind spots. When all is clear, change lanes. In addition to these basic rules, also make sure you maintain a consistent speed and keep a safe following distance from vehicles in front of you. Use your headlights if visibility is low. Decrease your speed when roads are slick. This skill will require a lot of practice in order to perform it correctly and confidently. If it is required on your state's road examination, practice by setting up a few cones or similar objects in an empty parking lot. This will help you develop the needed skills in a low-stress environment. Entering a crosswalk at an intersection or school zone before it is free of pedestrians is incredibly dangerous, and could be grounds for an automatic failure. If a person enters or looks as though he or she is about to enter a crosswalk, make sure the person has reached the other side of the street safely before you proceed. 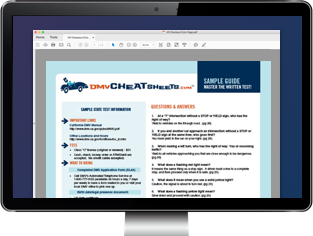 Most states require you to bring a safe and working vehicle to the examination (a test vehicle is usually not supplied). If your vehicle isn't deemed safe to operate, you likely won't be able to test at all. Also be sure to take the test in a vehicle you are familiar with.